Mr. Evan Rachel Wood at the Golden Globe Awards. Miss Jonathan Holleman at Northwood High School's Switch Day. Upon first glance you might just think Evan Wood was making a fashion statement, but as she explained, the move was more than just sartorial. Similarly, Miss Jonathan is not trying to protest trousers. Rather, he represents a long tradition of mothers dressing up their sons as daughters for a variety of gender-bending scholastic events. Of course, some sons are more willing than others to forgo trousers for frocks. When those special boys slip on a bra or girdle for the first time, they know it is so right and will prefer female finery for the rest of their lives. 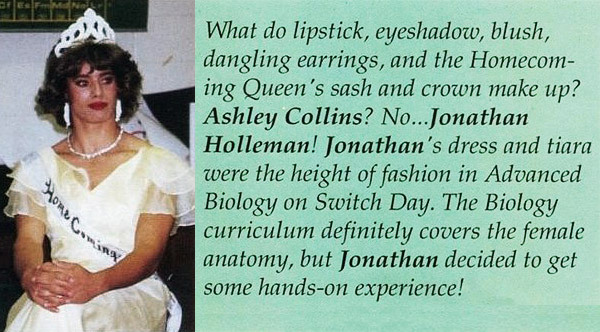 Miss Jonathan is just one of the pretty girls that Starla has uncovered in her search of online yearbooks, which resulted in over 200 new photos of male girls attending high school events en femme. Those photos are now available on flickr, where you may view the new photos by opening one of the Yearbooks sets (A through Z). There you will find the newest uploads at the end/bottom of the set. (The oldest uploads appear at the beginning/top of the set.) The contents of the Yearbook A through Z sets are organized according to school name, for example, the photos from Sacred Heart High School would be in the Yearbooks S set. By the way, if you participated in your school's womanless beauty pageant or attended some other school activity en femme, I would love to post your photos along with any description you would like to provide. The last time my wife and I went to a gala evening, she introduced me to her friend Roya, who happens to be a lesbian. Roya was wearing a jacket tie and trousers, but tailored to her female shape. That night I dreamed Roya gave me her "skirt permit" since she wasn't going to use it. I graciously thanked her, and I showed up to the next gala in a lovely gown of purple embroidered chiffon, satin pumps and a matching clutch purse. I can dream, can't I?